The purpose is clear. You don’t want your kids to steal your food from the cupboard, or from the fridge, or someone to open your locker. Or maybe you want to take pictures of your pet stealing food. Or maybe you are Dwight Schrute and you want to finally unmask the coworker that puts your stuff into jelly. So what can you do about it? You can hide a device in the cupboard/fridge/locker that will take a picture and email it to you when movement is detected. And if you use IFTTT, then you can automatically post the picture of the thief to Facebook or Twitter and show the thief’s face to the entire world! This project consists of a motion sensor (PIR), a camera, and a wifi connected device. Arduino Yún was my choice, because it is easy to use and to configure the wifi settings, but it can be easily substituted with a RaspberryPi. Configuring the wifi settings may be difficult with the Raspberry Pi without connecting it to a computer, but anyone can configure the wifi settings on the Yún. The project is very simple. It doesn’t require any soldering/electronics skills and it can be assembled in minutes. First of all, you need to configure your Arduino Yún network settings. This should be pretty easy following this guide. Test the connection to your Arduino. In your browser, type: http://arduino.local. You will see the Arduino web interface. We also need a software for taking pictures, I used fswebcam that is super small and very easy to use. 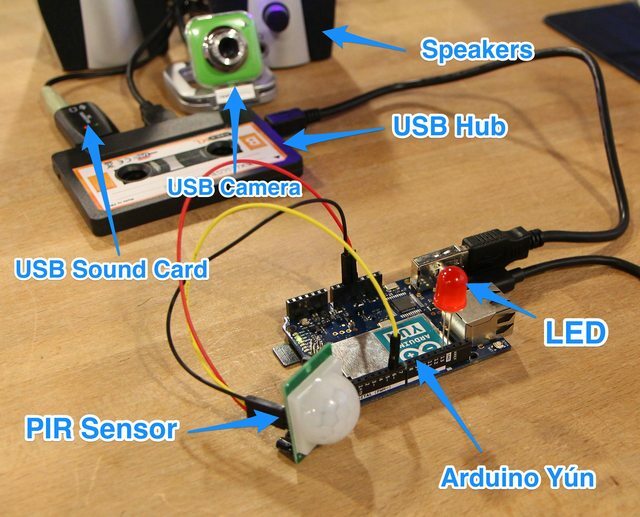 Now we can take pictures and play sounds… But we want more from our Arduino! We want to send them via email. So, what can we do? The answer is very easy… python script! 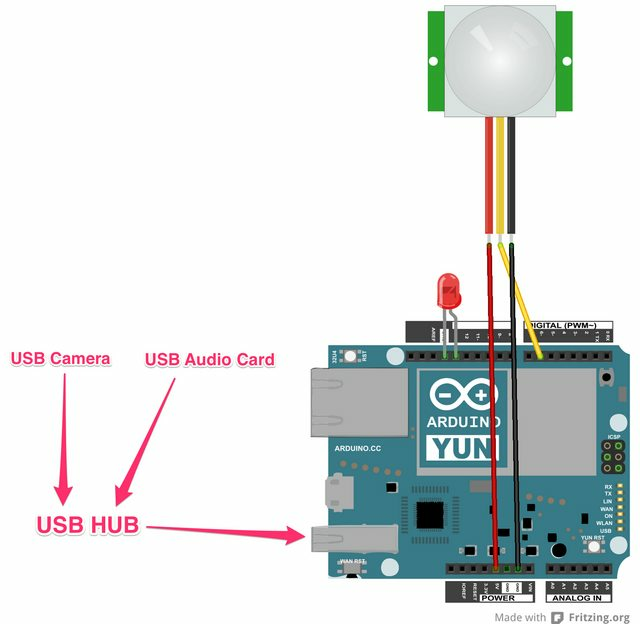 Even if the Arduino Yún integrates the Temboo library, I wanted this project to be as portable as possible, so we will use a very simple python script to encode the image file and send it to our email. And in a few seconds you will receive an email with the picture attachment… amazing! I used this PIR sensor, because it’s reliable and easy to use. * according to the state of the sensors output pin. After 10 seconds (calibration time) it will start working and making pictures!!! All the files of this project are available in my GitHub account. Team leader, software architect and developer, entrepreneur and passionate cook. In more than 16 years of experience in the Internet industry, I gained strong problem solving skills, working for very small clients and start-ups up to very big and complex enviroinments, including the major Italian public administration websites and large telecommunication, communication and fashion companies. I worked with many technologies and many teams, building reliable, scalable and performing solutions, and now I'm totally focused on the Internet of Things.